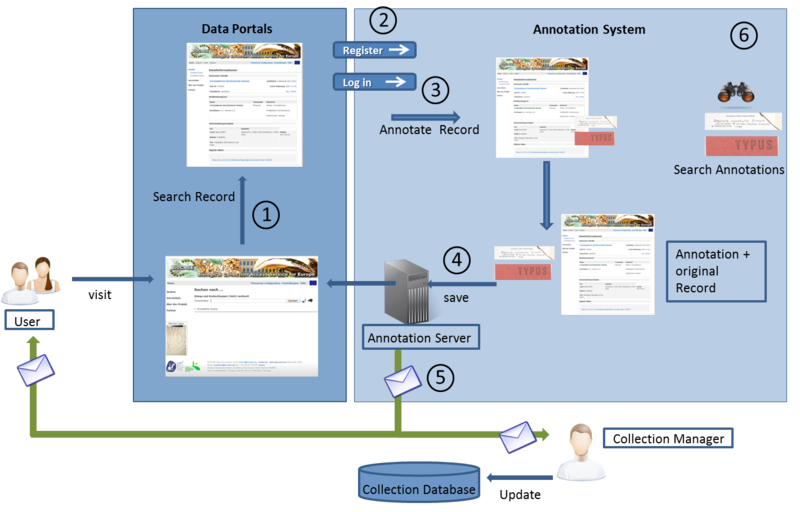 The user visits a data portal to access records (1). When wishing to annotate a record, he enters the annotation system and, after log in (2), conducts the annotation (3). The annotation is then saved on the annotation server together with the original record, both elements are connected via a GUID (4). The annotated version as well as the original record is then displayed to subsequent users on the data portal. It is also possible to search for annotations via the annotation system, using specific criteria (e.g. a taxonomic group or a country) (6). After an annotation has been conducted, a message system informs the collection manager about the changes in the record as well as users, who subscribed to the information service (5). The collection manager can then decide, whether he wants to adopt the annotation in his local database.